Vernal or Spring Equinox, the Rites of Spring, Lady Day, Alban Eiber and Bacchanalia.The Spring Equinox occurs between March 19th and 21st. Ostara marks the day when night and day are equal and balanced. The Sun God's strength increases. The Maiden celebrates her fertility. Life begins anew at this time. This is a time to plant the seeds of our flower, herb and vegetable gardens. Goddesses: Virgin Goddesses, Moon Goddesses, Goddesses of Love, Androgynous Deities, some Fertility Goddesses. Some Ostara Goddesses are: Aphrodite (Greek), Eostre (Teutonic), Ma-Ku (Chinese), Lady of the Lake (Welsh-Cornish), Minerva (Roman), Isis (Egyptian), Rheda (Anglo-Saxon), Coatlicue (Aztec). Gods: Gods of Love, Moon Gods, Gods of Song & Dance, some Fertility Gods. Some Ostara Gods are: Adonis (Greek), Lord of the Greenwood (English), Ovis (Roman Etruscan), Dylan (Welsh), Odin (Norse), Osiris (Egyptian), Attis (Persian), Mithras (Greco Persian). 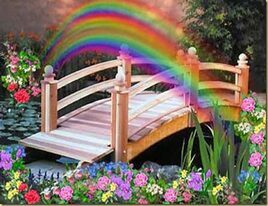 Traditions: Planting seeds, working on magickal or herbal gardens, herbal work, taking walks through gardens, parks, woodlands, decorating and coloring eggs. Incense: Floral of any type. Jasmine, african violet, rose, sage, strawberry, violet flowers, orange peel, rose petals, lotus, magnolia, ginger . Stones: Rose quartz, aquamarine, amethyst, jasper and moonstone. It's fun and easy to use foods and flowers to make your own natural egg dyes. The two main ways to use your own dyes are to add dyes to the eggs when boiling them or to dye the eggs after they have been hard-boiled. It's a lot faster to boil the dyes and eggs together, but you will use several pans if you want to make multiple colors. Dyeing the eggs after they have been cooked takes as many dishes and more time, but may be more practical (after all, most stoves only have four burners!). You can use fresh and frozen berries as 'paints', too. Simply crush the berries against dry boiled eggs. Try coloring on the eggs with crayons or wax pencils before boiling and dyeing them. Hunting eggs began at least 2000 years ago. In Asia and India spring egg hunting symbolized personal responsibility (karma) and reincarnation. In Germany and Scandinavia it was traditional in the Spring to offer eggs to the Goddess in return for blessings and favors. When Europe became predominantly Christian, egg offerings along with all other Pagan traditions were outlawed, subsequently the offerings to the Goddess had to be "hidden". The original Ostara Egg hunt was probably begun by the Christian authorities, and later became a child's game. Anglo Saxons buried eggs under barns and in gardens to increase fertility and abundance. I offer this egg, Your Blessings to bring. May abundance for all begin to flow. 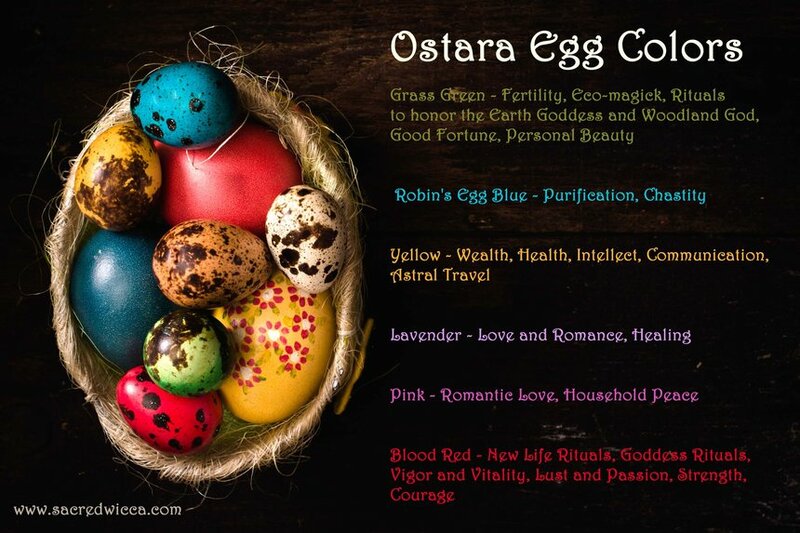 The Goddess Ostara is the Norse Goddess of fertility. 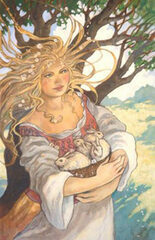 At the Spring Equinox we honor her, for she is the Goddess of Spring and renewal. Her symbols are the egg and the New Moon. Her animals are the rabbit and the butterfly. Mix all ingredients together and store in a tightly sealed dark glass vial. 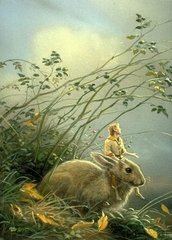 Why do we honor the Rabbit at Ostara? Rabbits and hares are associated with Goddess energy and it was long believed that witches could turn themselves into rabbits and travel the world undetected. Hares have long been the symbol of the Earth Goddess, in her aspect of fecundity, after all what animal is more fertile than a rabbit? Observe the movement of rabbits and hares in the wild as a form of divination. Movements to the right are positive answers to your question, movements to the left are negative. Random or jerky movements means that the answer is unclear at this time. Use hair from a rabbit to assist in all acts of divination. Add rabbit hair to potions of invisibility, secrecy or astral projection to enhance their potency. Rabbits and hares bring the blessings of the Goddess to land on which they live. Rabbit energy is quick, tricky, good for helping you to change course and escape bad situations quickly. Like Alice in Wonderland you can follow the rabbit down the hole into the Underworld.